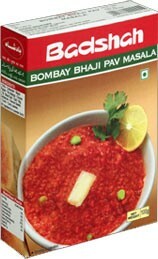 Buy Badshah Masala including Badshah Pav Bhaji Masala, Badshah Tandoori Chicken Masala and Badshah Chat Masala. 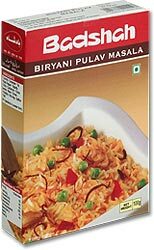 Badshah has created this aroma that makes your Pulav and Biryani extraordinary. This is an assortment blend that includes ground, leaf and whole spices. Rice preparations were never so delightful. This product has an aroma of it's own which makes it so special. Pav Bhaji is a dish from the western part of India that has long been one of India's favorite snack foods. It also boasts a very good nutrition value. Bombay Bhaji Pav masala assures you the best seasoning for this dish, Badshah assures you the best value and taste of this dish. Simply mix the spice mix with onions, potatoes, green peas, tomatoes and cook. Recipe provided on box. This unique spice blend is used to make the nutritious and ever-popular dish called Chana Masala. This dish can be prepared with either regular white chickpeas, or with its more nutritious cousin, Kala Chana (black chick peas). 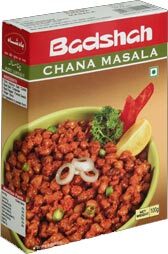 The unique aroma and flavor of Badshah Chana Masala makes this a necessary pantry staple. Ingredients: Chili powder, mango powder, salt, cumin powder, black salt, black pepper powder, fennel seeds, ginger and ajwain. 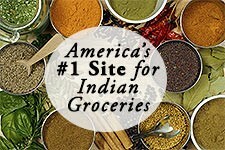 In India, chat refers to both a spice blend and a snack dish that uses this spice blend. 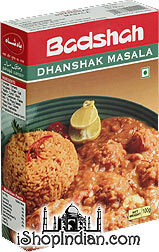 Sprinkle a bit of Badshah Chat masala on salads, fruit, potatoes, or any vegetable, to perk up flavors instantly. Dry Mango Powder, Black Salt, Cumin, Salt, Coriander, Chilly, Musk Melon, Black Pepper, Ginger, Citric Acid (lemon powder), Add Sugar as required. 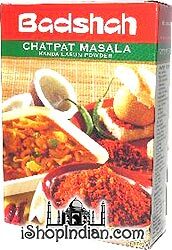 Chatpat Masala is a dry spice mix made of mostly Kanda (onion) and Lasun (garlic). It is used as a flavor enhancer, and is sprinkled on top of dishes for extra flavor. Ingredients: Chili powder, fresh onion, coriander powder, salt, fresh garlic, fresh ginger, oil, turmeric powder, cinnamon, clove and black pepper. 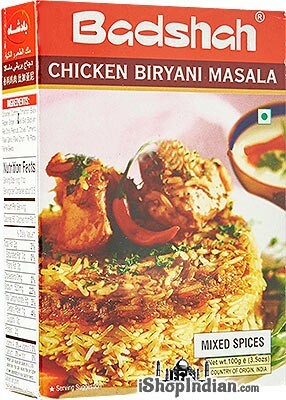 A delectable spice blend to make the perfect Chicken Biryani. This pack contains 6 servings for 4 people each. Easy to follow recipe provided on the box. Ingredients: coriander, cumin, cinnamon, black pepper, ginger, salt, star anise, red chilly, peanuts, cloves, turmeric, garlic flakes, onion flakes, bay leaves, fennel seeds. 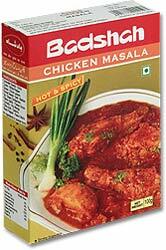 Now make your chicken more mouthwatering with Badshah Chicken Masala hot 'n' spicy. It has properties that gives chicken a more mouthwatering, robust and hot flavor, with just the perfect mix of spices. This specially formulated spice by Badshah creates a fervour that will captivate your senses. Mix the masala with chicken, chili paste, garlic paste, yogurt (curd), sugar, fresh coriander and ghee. While preparing the Parsi dish of Dhanshak, you do not need to bother about collecting various spices for bettering the taste, just use Badshah Dhanshak Masala and let your guests keep guessing the secret of your culinary skills, because we care for you and also your traditional taste. Ingredients: Coriander • Turmeric • Fenugreek • Ginger • Salt • Tejpatta • Cumin • Black Pepper • Cardamom • Flakes Garlic • Cinnamon • Poppy Seeds • Flakes Onion • Cloves • Mutard • Asafoetida. 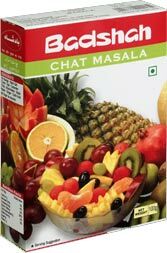 Processed and packed hygienically from the best available mango, Badshah Amchur powder is an excellent tastemaker to all your foods. It adds a zing in your foods and gives it a characteristic sourness to most Indian foods. Yes, it is also used as a natural meat tenderizer. In fact, it can just be sprinkled on foods or added during the cooking process itself. 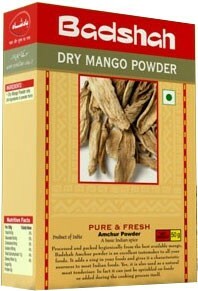 Ingredients: Dry mango powder only. Spice mixture to make an authentic fish and rice dish. Cooking instructions provided on the box. This spicy seasoning can be used for all kinds of fish recipes. 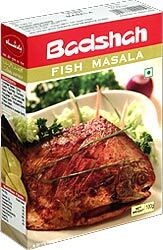 Badshah Fish Masala is is an exotic preparation of Indian spices specially blended for fried fish and fish and seafood curries. Use to season fish curry, or add to fish and seafood when fried with onions, garlic, and ginger. Coriander Seeds • Chilly • Cumin • Bay Leaves • Turmeric • Black Pepper • Salt • Fenugreek • Clove Leaves • Flakes Garlic • Mustard Seeds • Flakes Onion. A patent product of Badshah, made of the best of traditional ground spices. It adds a sensational flavor to your food and a lingering aroma to your mind. 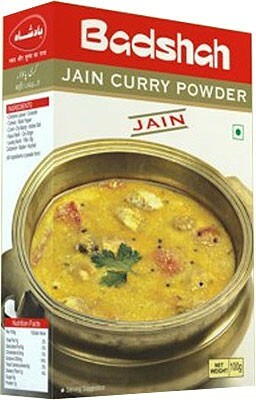 This spice has been created, keeping in mind Jain food regulations, without the addition of garlic and onion powder. 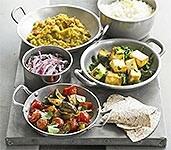 Ingredients: Coriander, Cinnamon Leaves, Black Pepper, Cumin, Dry Mango, Trifla, Turmeric, Salt, Kasuri Methi, Cinnamon Leaves. 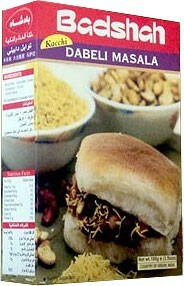 Get the authentic Kacchi taste in your homemade dabelis with the Kacchi Dabeli Masala from Badshah. Ingredients: Red Chilli, Coriander Seeds, Cinnamom, Cloves, Cumin Seeds. Kadhi is a traditional delicacy forming a vital part of Indian cuisine. It is yogurt-based soup dish, usually served as an accompaniment. For added flavor, try adding fried okra, drumsticks, sev or even pakora to enhance the flavor. Badshah Kadhi Masala makes this sumptuous gravy even more delightful, aromatic and easy to cook. Easy to follow recipe provided on pack. 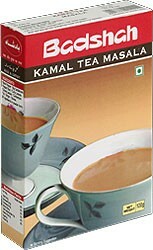 Now enjoy mankind's most preferred beverage Tea, with Badshah Kamal Tea Masala and let it's unique formulation and aromatic fervor capture your senses. Not only does it enhance taste and aroma, it's antioxidant properties refresh your mood and senses. Use this tea spice mix to make traditional Indian Masala Chai! These are sun-dried fenugreek leaves. Its robust flavor should be used sparingly. It is usually sprinkled over meat and vegetable curries before serving, but can also be used in Indian breads, such as thepla, as shown in picture. Contains no artificial colors. 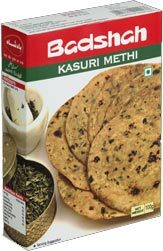 Methi assists in digestion. $1.79 Notification will be sent to your e-mail address every time the item price is decreased. 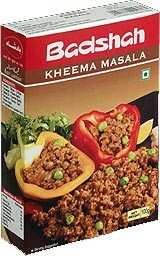 Kheema Masala at it's best with Badshah Kheema Masala. 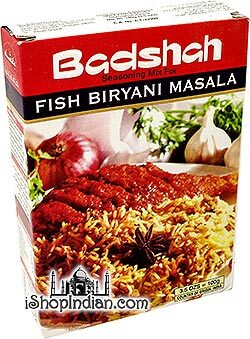 This specially formulated spice blend by Badshah creates an aroma that was never sensed before. It gives kheema (minced meat or lamb) a richness of color and taste, making you crave for more each time you use this spice. Khichadi is a traditional dish made with rice, lentils and spices. It is a complete, healthy meal full of protein, minerals and vitamins. An easy to follow recipe is provided on the box. It requires rice, moong dal, toor dal, chana dal, green chillies, cumin , turmeric powder and butter. 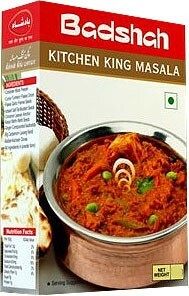 Badshah Kitchen King Masala is a versatile spice blend for all purpose seasoning. Use it sparingly with any curry to get enhanced taste and aroma. It gives your recipe authentic unmatched taste, making your vegetable curry the perfect host of your kitchen. Ingredients: coriander, black pepper, cumin, turmeric, onion flakes, garlic flakes, fennel seeds, iodized salt, cinnamon, mustard seeds, cinnamon leaves, amchur, kasuri methi, methi seeds, ginger, compounded asafoetida, big cardamom, clove and star anise. 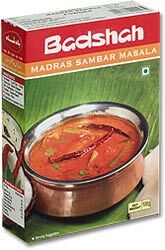 Badshah Sambhar masala (also spelled Sambar) is a classic spice blend commonly used in South Indian cooking. It is especially used in cooking a thin, lentil and vegetable soup called Sambhar. Now enjoy South Indian dishes with Badshah Sambhar Masala and relish the best South Indian dishes with our classic recipe. Enjoy with other South Indian delights like idlis, vadas or dosa.